Hi Friends, are you feelin' all the "Spring" Love this week? 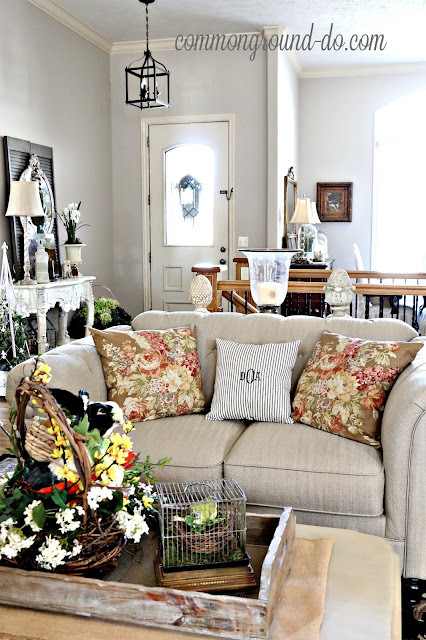 It's overflowing here in Blogland with all the Spring Home Tours filled with beautiful decor and ideas to get us out of the winter doldrums and bring us into all the fresh colors and warmth of the new season. Today, I'm joining with a fabulous group of bloggers who are helping Marty of A Stroll Thru Life Welcome in Spring. If you're coming from Kim at Sand and Sisal thanks so much for coming by, and I hope you've visited the rest of the Wednesday group. You'll find those links at the end of this post, so you can see what they are sharing. I don't often show "Big Picture" photos, but I do when I'm on a Home Tour or Blog Hop. 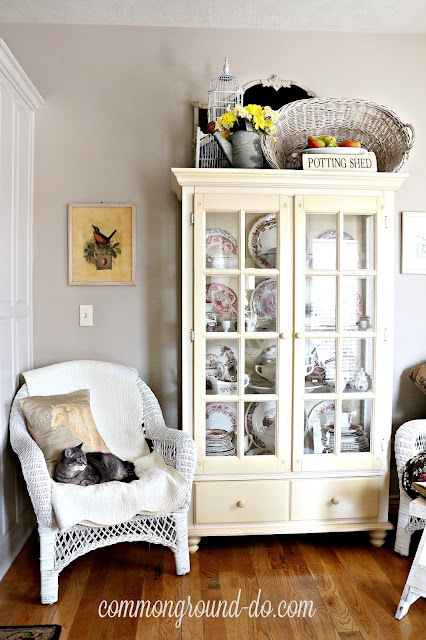 Since there are often new visitors to my blog, it's hard to get the feeling for a room or space if you just see small vignettes or individual items... so I like to give you a little of each. I've always been drawn to cottage type interiors; spaces that are comfortable and cozy, where you feel like you can relax and wind down. I use color, but mostly with a neutral background, and much of the time the "color" reflects the current season. 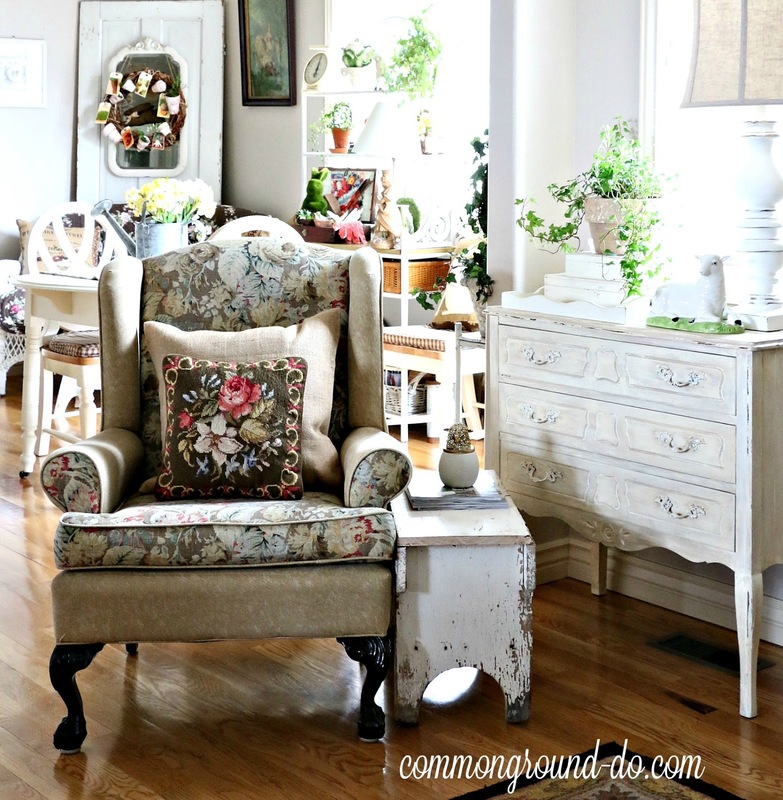 I have a background as an antiques and vintage goods dealer, so my home reflects the things I love and collect. 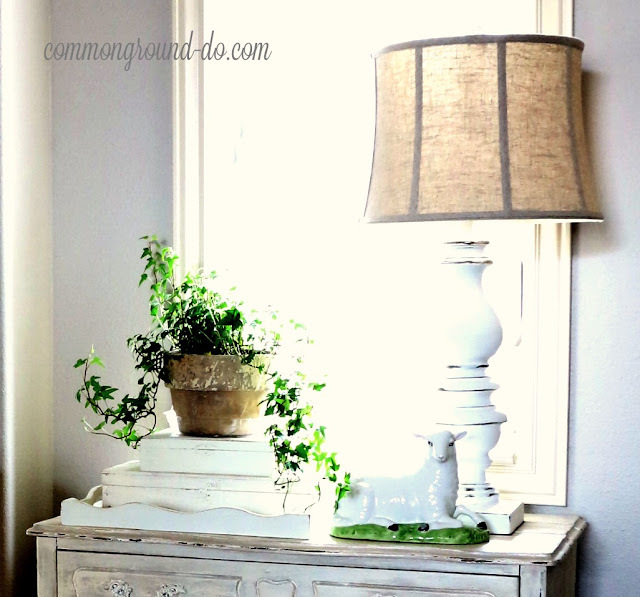 This is a small French style dresser that I've had for years. It's changed as my decor theme has changed. When I first bought it it was black and distressed. 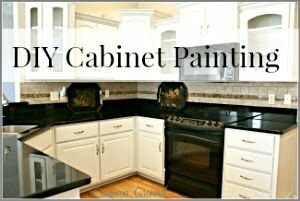 It went from there to white when I painted most of my furniture. 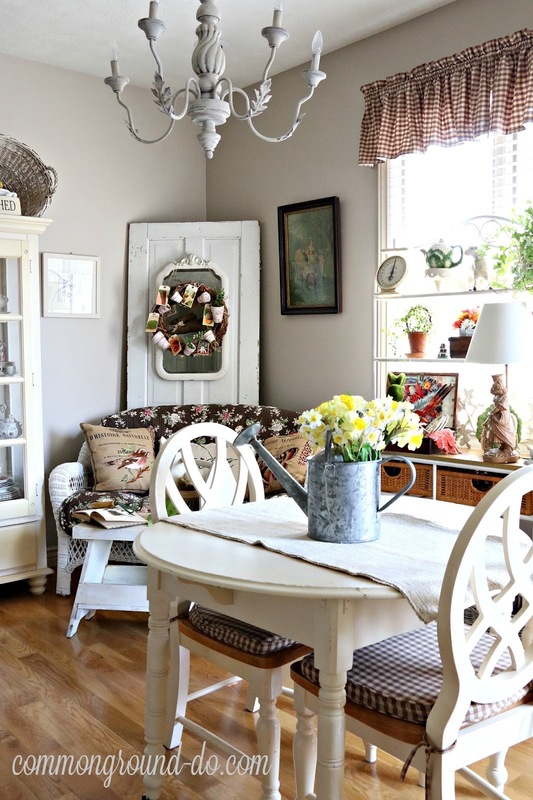 Then when we moved to this home it's taken on more of a gray/greige tone with heavy distressing. It used to be in the Entry, but here it's perfect for under the window with one of my Balustrade Lamps. An Ivy on a stack of vintage boxes and a Porcelain Lamb share the tabletop grouping. We have a very open concept home with a walkout basement, but most of our day-to-day living is done here on the upper level. 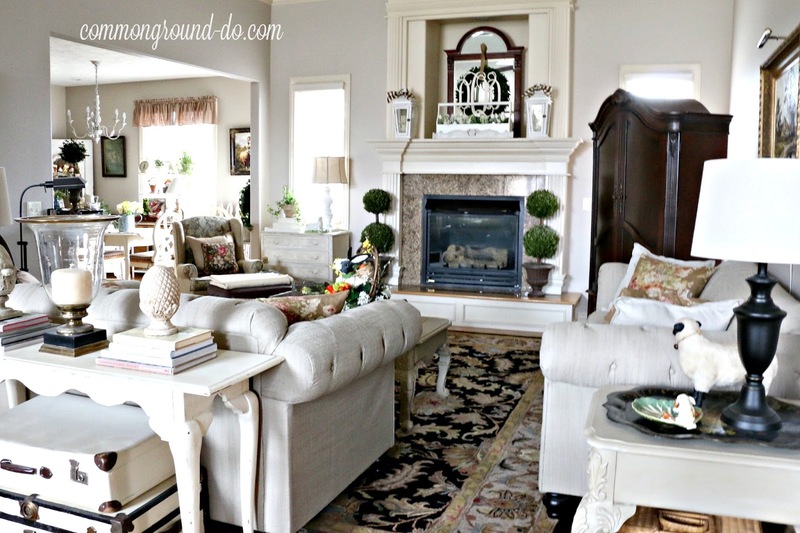 It's basically one main space that encompasses our Entry, Dining Room and Living Room. Then the Kitchen and Kitchen Sitting and Dining space open on into that. With an Open Concept home the main thing is that patterns, colors, fabrics and style all need to be similar so the flow will be natural and organic. My one big concession to pattern are the rugs, but I wanted black and traditional to ground the pieces and bring them all together. 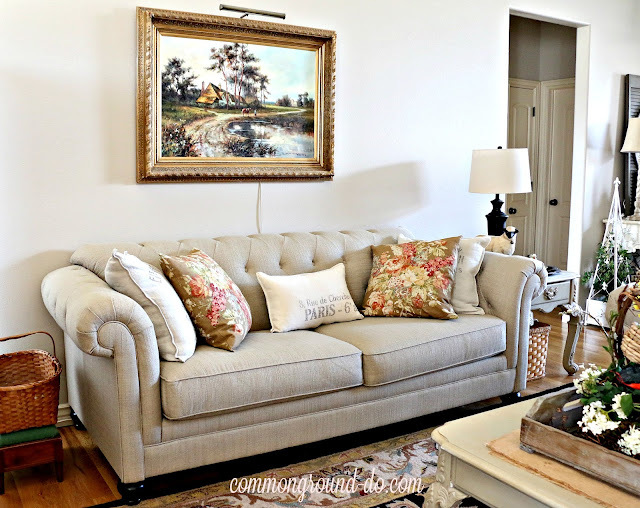 My neutral Linen sofa and loveseat make it easy to change out groupings of pillows for each season. I do have a few obsessive addictions (in a good way). Pillows happen to be at the top of the list. 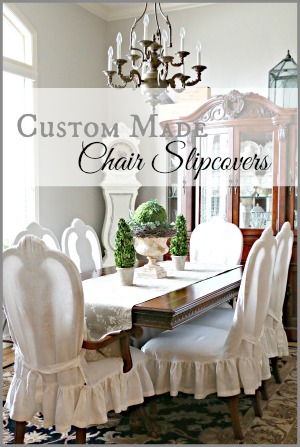 They are such a quick, easy, and relatively inexpensive way to change the feel of a room. I like using a little "whimsy" in my home, and find seasonal decor to be a way to keep things fun and fresh. 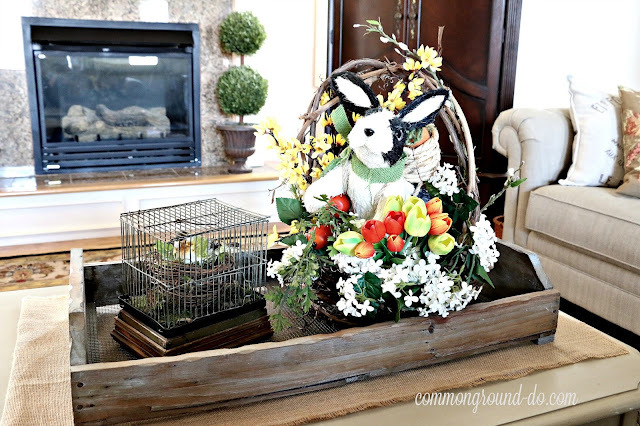 I put this Willow Basket with Bunny arrangement together last year for something colorful for Spring. 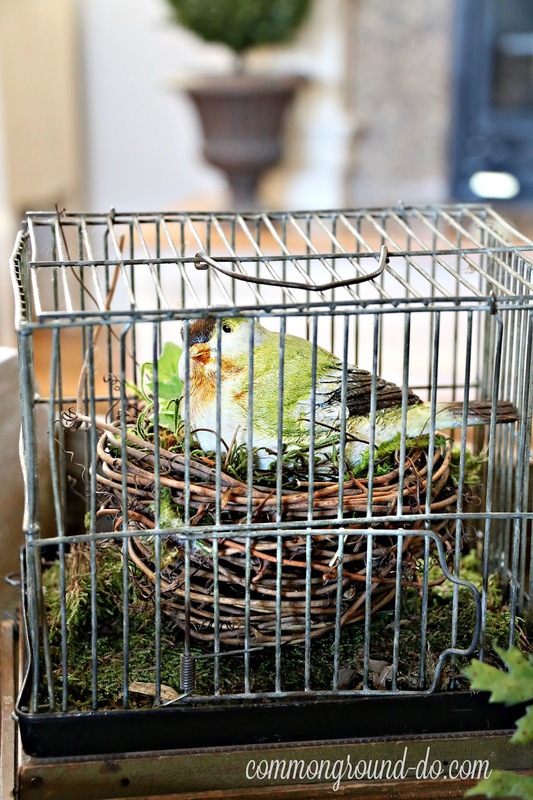 He's back this year joining a small birdcage with a nesting spot. If you've read any of my posts on decorating my mantel, then you'll know the frustration I feel with each new Season. I'm short, it's gigantic. Finding something that doesn't get lost up here is always my first consideration. This Spring I'm trying something new on the mantel. 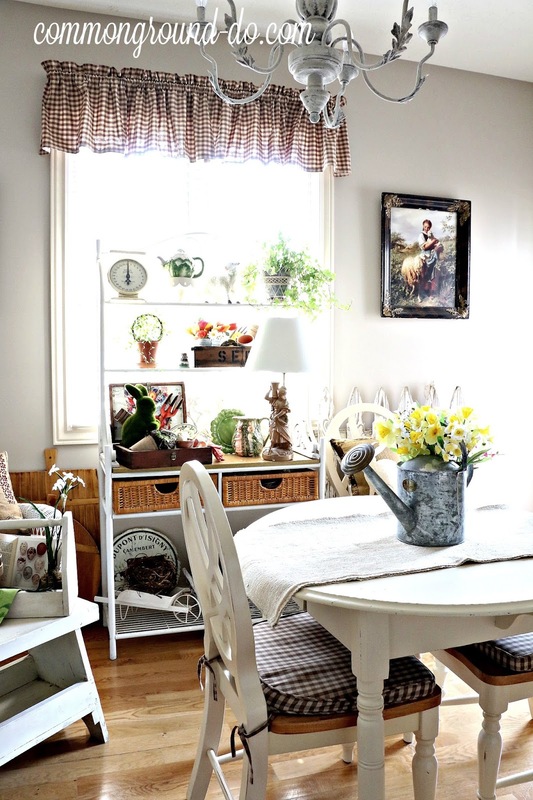 A long vintage carpenter's tool box filled with mason jars and Spring bouquets in white. 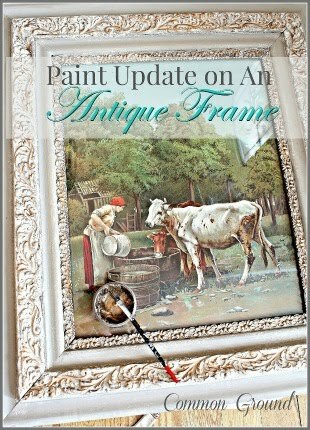 An Antique architectural piece is leaning against it for a little more detail. This is the spot where most of my vintage fun happens; The Kitchen Sitting Area, and rotating quilts and pillows on my white wicker is the basis for my seasonal decor. An old Baker's Rack gives me lot's of space for vintage odds and ends to gather. 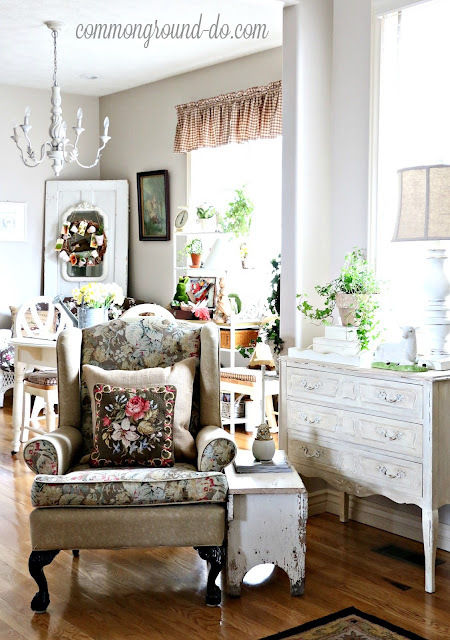 This is the space where I enjoy mixing color, pattern and vintage textiles. I made this Flower Pot and French Seed Packet Wreath several years ago, and it's become one of my favorite pieces to usher in the garden goodies I love to display each Spring. The old door and mirror are holdouts from my sunporch from my last home. 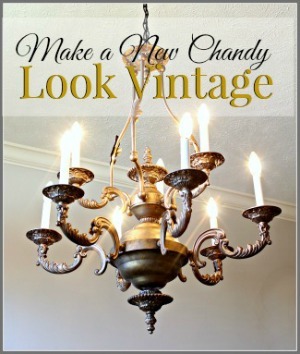 I couldn't part with them, so they bring that same vintage feel to me here at our new house. Transferware bits and pieces in red and brown harmonize in the Kitchen China Cupboard with some of my Ironstone tureens and pitchers. It's a mish mash, but always fun to add little surprise seasonal elements. Making her photo-bombing comeback, is my little sweetheart that's been really fighting a good fight coming back with daily injections for Diabetes. She was downhill fast in January, but is feeling enough better she wanted to say Hello, and thank you all for all the good thoughts and prayers. Thank you so much for visiting, and thank you too, Marty, for including me in your wonderful Spring Home Tour. 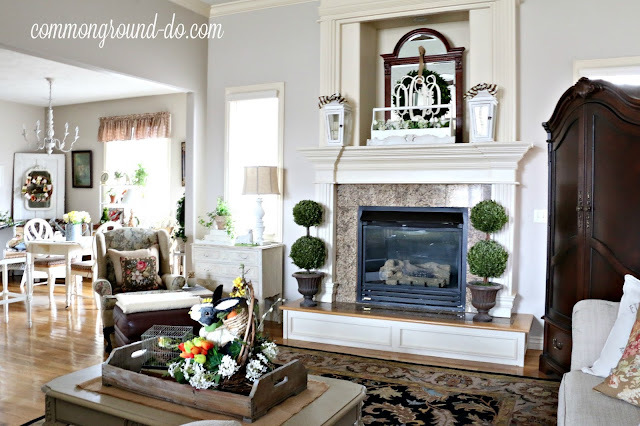 I have a lot more Spring decor to share so I hope you'll come back and be a regular visitor here. Here's the list for this week, enjoy all the fun and inspiration! It all looks beautiful Debra. I really like the tool box on your mantel. I have those difficult spots to decorate too - the ones where you have to keep going up and down the step stool to see how it looks! thanks JoAnne, yep, that's how I get my exercise! I really enjoyed your beautiful tour and any home is better with a kitty in it. Happy spring! thankyou, Julia, I think life in general is better with a kitty in it! Happy Spring to you too! 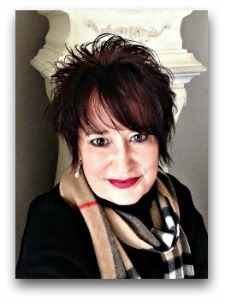 Debra I am completely enchanted with your tours! I will be featuring one of your vignettes later today on IG. Just came from your IG page, Laura. thanks so much for sharing my little French wagon and rabbit! I love how you make your antiques look fresh with your pretty colors and vignettes. Always so much to see. 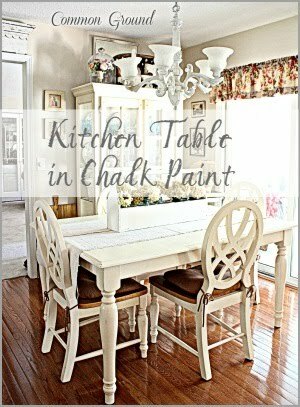 I especially love your kitchen sitting area. It look so inviting and would be my favorite place to enjoy. Thanks so much for joining the tour, your home is always done so beautifully. thanks so much for including me, Marty! There are so many talented gals with oodles of decorating talent and inspiration! 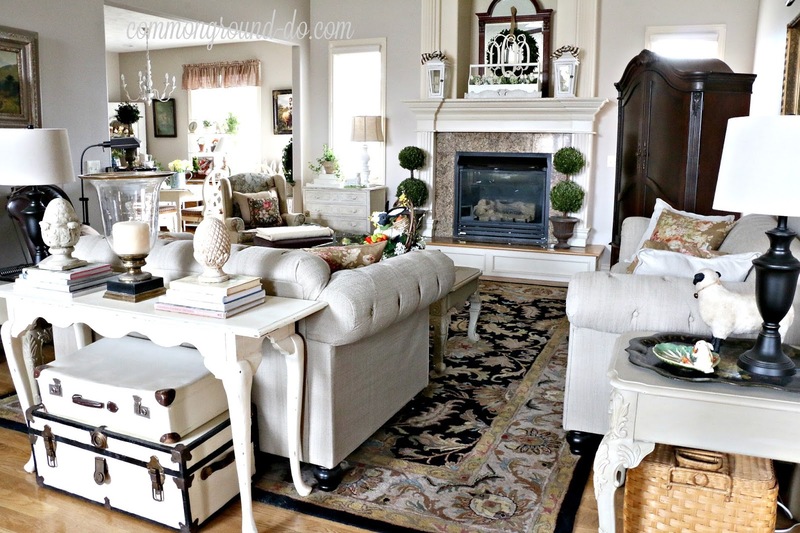 Debra I always enjoy touring your home, admiring your pretty vignettes. I love the bouquet of daffodils in the watering can. 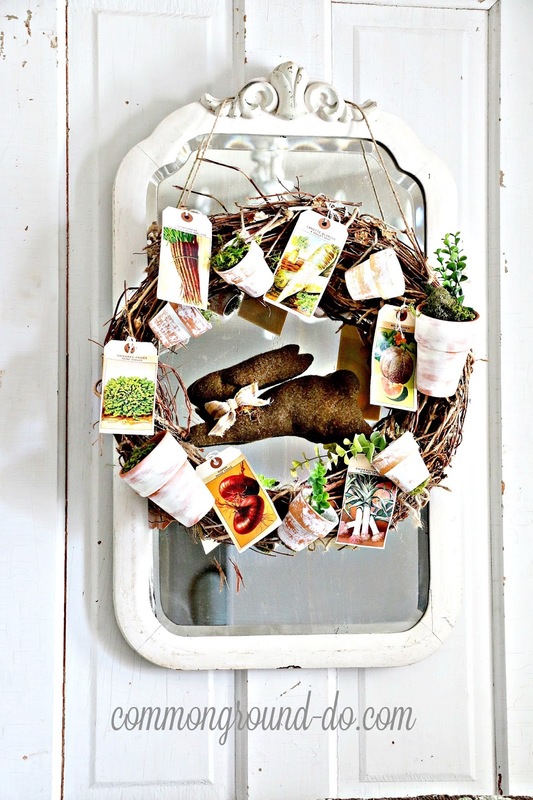 And that flower pot and seeds wreath is gorgeous too. So much to see! thanks so much Cristina. I just came from your place and I'm in love with your blues and greens color palette. gorgeous! Hi Debra- I am right there with you on the pillow obsession thing. It can't continue...or can it. I always love your touches particularly your mantel. I have the same issue with my fireplace and mantel bring floor to ceiling so i have to size it right so it dosn't look goofy. yours looks great. Hope you are doing well! I think my obsession is closer to full on addiction, I have a storage room under the stairs completely full. I guess I'll have to find another stash, maybe under sofas and in the extra bath. shesh. 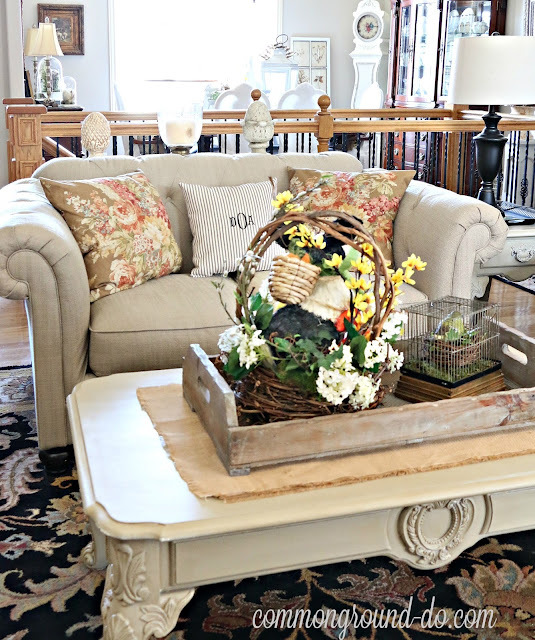 I love all the spring touches in your home Debra esp. 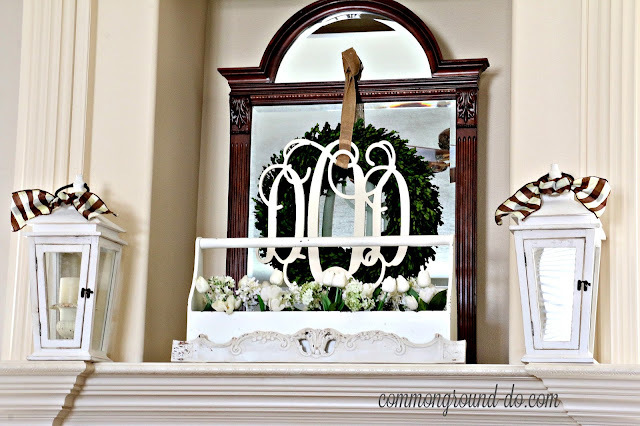 that wreath on the mirror! So honored to share this home tour with you dear! Hi Vel, thankyou so much, I'm really looking forward to seeing your lovely home dressed for Spring tomorrow. You amaze me with your use of wall pattern, just gorgeous! Your home looks so cheerful and pretty for Spring. I have a pillow addiction too. It grows every year despite trying to get rid of some. You have some pretty ones! 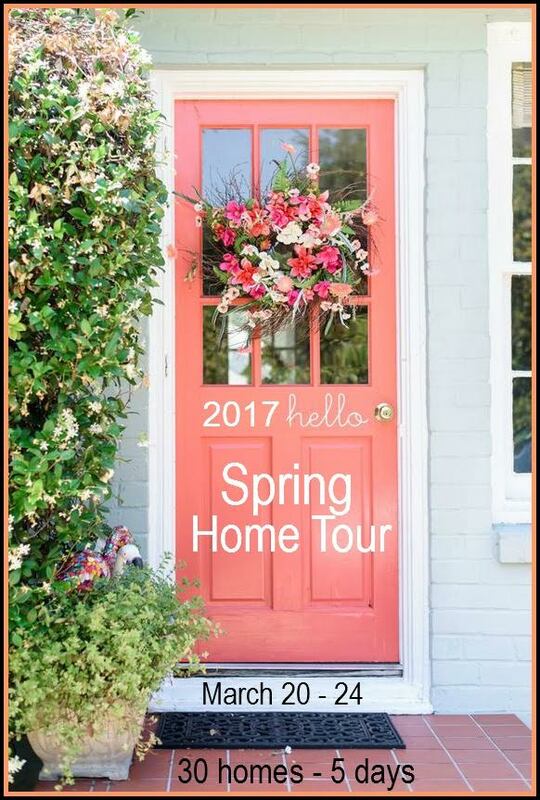 I really enjoyed your Spring home tour. 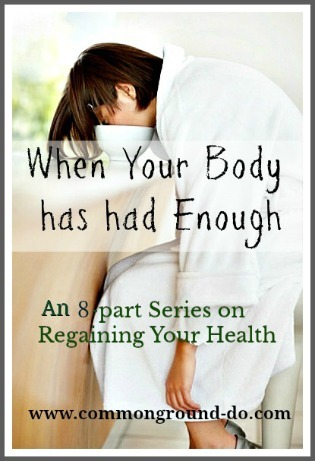 Hi Kelly, yes, I think that pillow illness is a life-long affliction, te he! Your home is so charming and fresh. 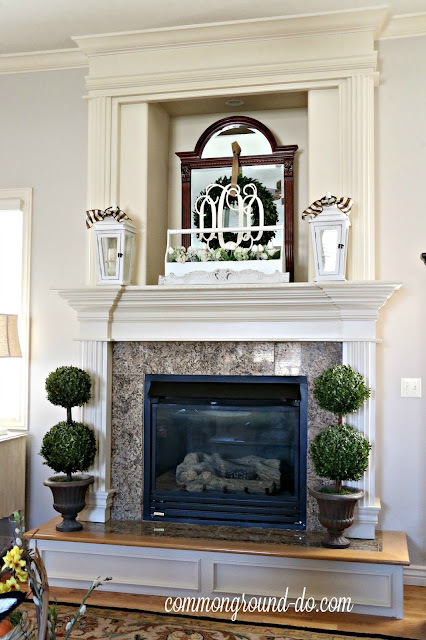 I espcially love your mantel. 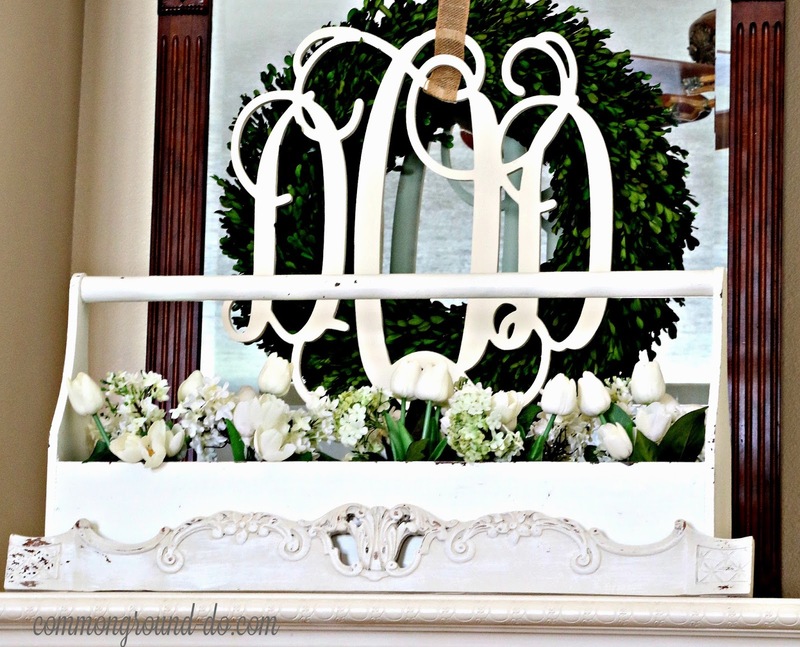 I have similar monogrammed letters from Etsy and I never thought to use it on top of a wreath. Thanks for the inspiration! So glad to be on Marty's tour with you. Jennifer@decoratingdelirium. thanks for coming by to say hello, Jennifer, as I said in my comment to you, I'm a HUGE fan! You have the gift of styling. 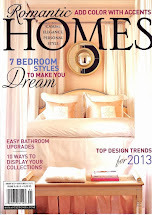 I always find great ideas just from looking at your beautiful home. Happy Spring. oh thank you Judith, Happy Spring to you too! Your home looks so warm and welcoming, Debra. I could just sink into your sofa with all those lovely pillows! I love the darling black and white rabbit perched in the basket of spring blooms. Sweet! Thanks so much for sharing your spring home tour with us and have a wonderful weekend! thankyou sweet friend, have a wonderful (and warm?) weekend! Love you home!! 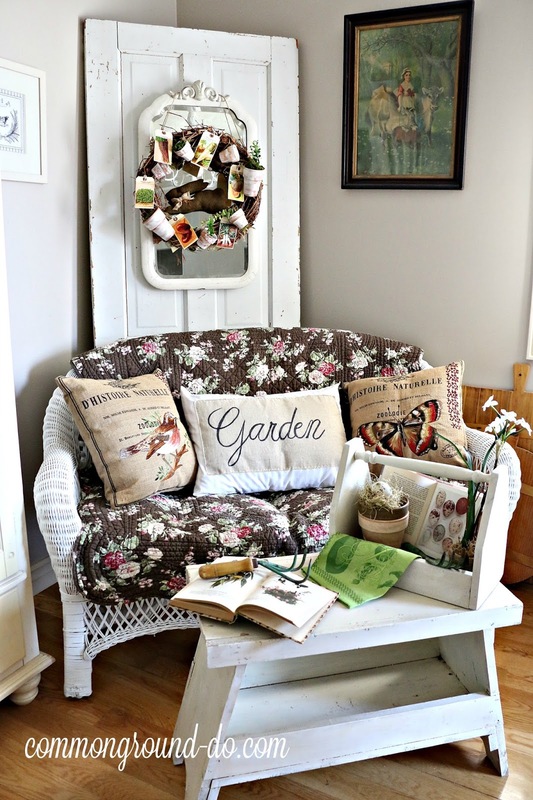 So many spring ideas, just beautiful! !